I love marshmallows, but the synthetic pink and white cylinders we most commonly see aren’t really the best of examples. 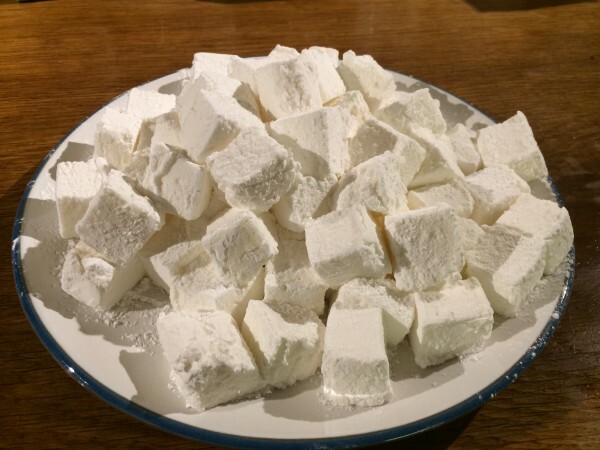 Really good marshmallows can be quite hard to find – they should be pillowy soft and melt into your mouth as you bite. They should be sweet, but not sickly sweet. As I said, the really good ones are trickier to find, but luckily, it turns out that they are surprisingly easy to make. Sieve the icing sugar and cornflour together. Lightly oil a tin, about eight inches square and a couple of inches deep. Sprinkle liberally with some of the icing sugar/cornflour mixture. Dissolve the gelatine in 125ml hot water, mixing thoroughly until completely dissolved. Put the sugar and 250ml of water into a pan, heat and stir until all the sugar is dissolved. Turn up the heat and bring to the boil. Boil vigorously until the temperature reaches 122C. Take off the heat and stir in the gelatine mixture. Beat the egg whites in a clean bowl until they form stiff peaks. Whilst still beating, slowly pour in the sugar syrup. Add the vanilla essence. Keep beating for another 5 – 10 minutes until the mixture starts to thicken. It should be thick enough that you can draw patterns in it that hold their shape for a couple of seconds, but still be thin enough to pour. Pour the mixture into the prepared tin. Leave in a cool place for a couple of hours to set. Now, the tricky bit. Sprinkle a board liberally with some of the icing sugar/cornflour mixture. Using a palette knife, or similar, loosen the mixture around the edges of the tin. Turn the tin upside down and gently ease the mixture out onto the dusted board. Once out, sprinkle with more sugar/cornflour. Cut into squares, again dusting all surfaces with the sugar/cornflour mixture. Store in an airtight container, lined with baking parchment. Anyway, your marshmallows look perfect! > Store in an airtight container, lined with baking parchment. My tummy is airtight and doesn’t need baking parchment. Shall I come over, Dave? Dave – they look gorgeous. I had some raspberry ones at Bea of Bloomsbury last year and have wanted to make some ever since. You should definitely try making some! I tried making marshmallow once before, and it was a bit of a disaster, as I was trying to top cookies and then cover in chocolate. I think the tray would be a lot less messy, thanks for the inspiration to try again! You mean like a Tunnocks Teacake? I can imagine that would be quite tricky to get right – I’m not sure how you’d get it to stay on top of the biscuit without it running off before it set. Presumably you need some sort of mould? It would be nice to be able to make those though, I love Tunnocks Teacakes! You really should try making the marshmallows in a tray though. I’m really pleased with the way they turned out – they’re certainly the best marshmallows I’ve ever tried.